Brittany, in the far north west of France, is a fantastic place to go on a camping or glamping holiday. Its dramatic rocky cliffs and sheltered coves account for a staggering third of the entire French coastline. It’s no wonder then, that it’s known for seafood, lighthouses, sailing and all things maritime. There are campsites all along its coastline and inland too where ancient forests and Neolithic megaliths punctuate the countryside and act as reminders of this region’s long and fascinating history. Not only is Brittany one of France’s most alluring destinations but, as it’s in the far north of the country with ferry services directly to its shores, it’s one of the easiest to reach too. Family camping with swimming pools, waterslides and heaps of facilities, on the edge of medieval Dol-de-Bretagne and within easy range of Brittany's northern coast. It’s proper camping on the farm, but with every creature comfort. 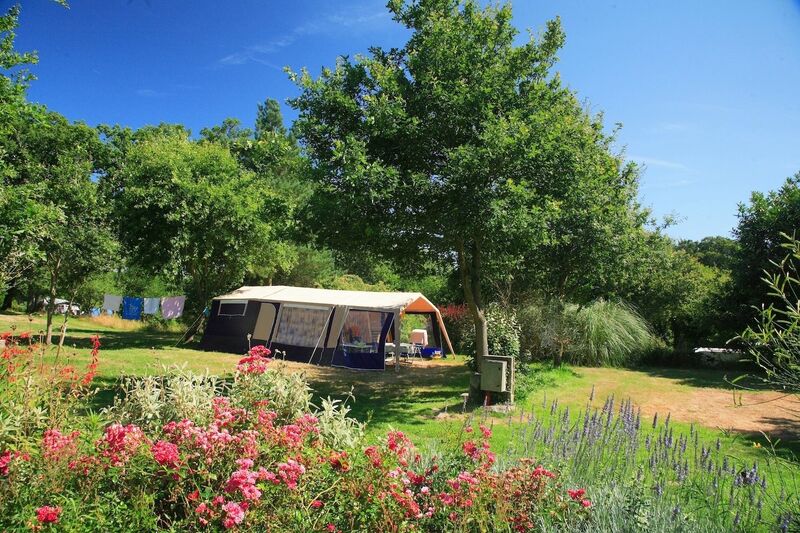 From riverside camping retreats to glamping getaways on the coast, discover the very best camping, glamping and campervan campsites in North West France with this hand-picked collection of special campsites in the Côtes-d’Armor department in Brittany. Whether it's kicking back on a beach or hiding away inland in the Armorique Natural Park, discover the very best places to pitch your tent or park up your campervan with this hand-picked collection of the very best campsites in the Finistère department of Brittany in North West France. From kicking back on the beach to exploring historic French towns, enjoy a camping holiday in Ille-et-Vilaine in Brittany with this hand-picked collection of the very best campsites and glamping getaways in the region. Occupying the north-west corner of France, Brittany’s coast curves around from the Channel to just north of the Loire. It includes rocky promontories jutting out in to the Atlantic as well as sheltered sandy beaches, harbour towns and mighty port cities. Some of the best campsites in Brittany offer far-reaching sea views from lofty positions on clifftops while others are just a few steps from soft sands. Then there are the inland sites where you can pitch up on farms and in forest clearings for a taste of the quiet life that rural France offers in spades. It’s a region that’s full of historic sites and opportunities for outdoor activity with the fantastic food, wine and culture that France is famous for thrown in to the bargain. 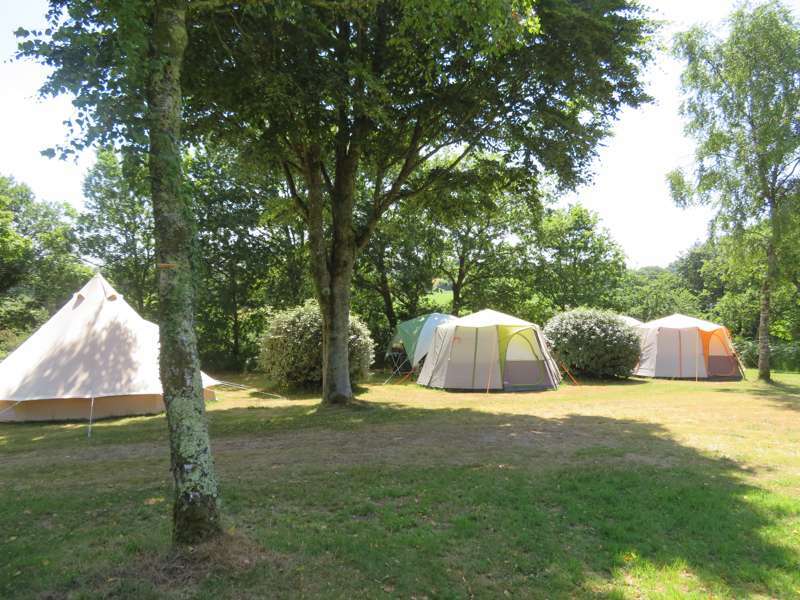 Whatever you’re looking for from a camping or glamping holiday in Brittany, you’re sure to find something to suit you in the Cool Camping collection. We’ve found sites which are perfect for families and sites which are just right for romantic retreats and we’ve only given the thumbs up to places that we think offer something a little bit special. France is such a popular destination for campers from all over Europe that it is well set-up with campsites to suit every taste. Brittany is no exception with hundreds of campsites across the region. We’ve selected the cream of the crop to feature in the Cool Camping selection; these are usually smaller sites and are often, but not exclusively, independently owned and operated. In France classic camping often means more services and facilities than we’d expect from a basic campsite at home. On check-in you’re likely to be asked if you’d like morning croissants and baguettes delivered from the local boulangerie and there might be a swimming pool, table tennis facilities and sports courts too. Whether or not your campsite on the Continent has these extra touches, there’s something truly wonderful about classic camping in France. Firstly, there’s the weather, which tends to be a little better than the UK, and then there’s the fact that it’s one of the easiest destinations to get to for a camping holiday abroad. You can pack up your own car and take a ferry straight to Brittany’s shores or enjoy a road trip across northern France from Calais. And once you’ve pitched your tent and set up your home-from-home, you’ll be immersed in the great outdoors, often enjoying a rural location or sea views that would be charged at a premium if you were staying any other way than in your own tent. If you don’t have your own camping gear or don’t fancy taking it over the Channel, you can go camping the easy way. Choose glamping in Brittany and you’ll enjoy all the advantages of a camping holiday with none of the hassle. You won’t have to pitch your own tent and you won’t have to take it down again, there’ll be more room in the car on the journey and you’ll probably have more room in your accommodation too. Just how much room will depend on the glamping accommodation you choose. Glamping includes everything from simple bell tents that are pitched ready for your arrival to elaborate treehouses that expand over two storeys. If you’re camping as a couple, a simple one-room bell tent or yurt might be just what you’re looking for but if you’re taking the whole family you might prefer a safari tent which usually features separated canvas bedrooms and living spaces. At the upper-end of the glamping scale are cabins, shepherd huts, gypsy caravans, geo-desic domes and camping pods. Some are simply furnished and require you to provide your own bedding and some offer full-on luxury with bells, whistles, hot tubs and more! If you’re going on holiday in Brittany out of the summer season, glamping is a great option for an outdoorsy holiday. You are still just steps away from Brittany’s lovely scenery but you’ve got a place to cosy up if it’s cool and to shelter from any inclement weather – and you won’t have to pack up a wet tent at the end of your stay either. A family camping holiday in France is one of the best-value ways to take your kids abroad – and one of the most memorable too. If you didn’t go on a camping holiday to France as a kid, you probably know someone who did and it’s likely that they still reminisce about the experience now. The fact that many families end up making an annual pilgrimage to go camping in France speaks volumes. And it’s not hard to see why it’s so popular. Kids tend to love the adventure of camping and France’s typically better weather, wealth of destinations and proximity to the UK make it an attractive prospect. While the sunshine of the south of France is a big draw, Brittany’s location in the north, tantalisingly close to British shores, make it a worthy option for family camping. There’ll be fewer cries of “are we nearly there yet?” on the way to Brittany thanks to the comparatively short journey time – and while the weather may be slightly less reliable in the north of France, it is likely to be less sweltering than the south in the summer months. 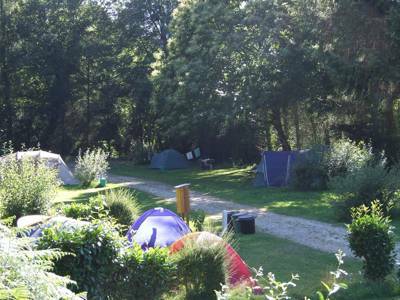 It’s not hard to find a family-friendly campsite in Brittany as there are plenty of them. 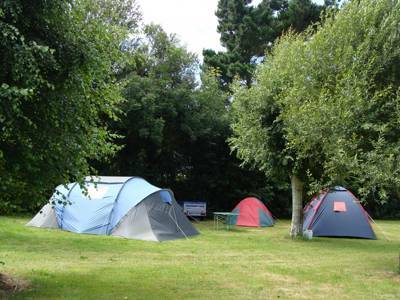 Most campsites have been set up with kids in mind and there are often children’s play areas, sports facilities and activities for them to enjoy. Choose somewhere that’s got a family-friendly set-up and you are likely to find another great asset – other families! Staying on a campsite is a sociable experience and your children will love making new friends on site – in fact they will probably have found playmates before you’ve pitched the tent or unpacked. The only likely issue with taking children on a family camping holiday in France is persuading them to go home again at the end! You can fly from various UK airports to Brest or Dinard in Brittany – a short journey that will have you touching down on French shores before you’ve had time to say bon voyage. But the best way for campers to get to France is to cruise across the Channel. You can pack up your car or, for the really self-sufficient, backpack or saddlebags, and hop on a ferry at Portsmouth or Plymouth for an overnight sailing to Brittany. It’s an exciting and romantic way to start your holiday and convenient too. From Portsmouth, you’ll disembark in the historic walled city of St Malo and from Plymouth you’ll be deposited further west in Roscoff. If you don’t like the idea of a long sea journey, you can cross the Channel at its narrowest point from Dover to Calais by ferry or on the Channel Tunnel and enjoy the drive west through Normandy to reach Brittany. If you fancy camping by the sea in Brittany, you’ll be spoilt for choice. A peninsula jutting out in to the Atlantic, Brittany has an astonishingly long coast measuring in at 1,700 miles. It’s a mostly craggy promontory, with the highest concentration of lighthouses in the world, and is perfect to explore on foot or mountain bike. On the north-facing, Channel side of Brittany you’ll find a range of destinations starting in the east, where Brittany meets Normandy, with Mont St Michel Bay. Stretching from Granville in Normandy to Cancale in Brittany, this 500-kilometre bay surrounds the tidal island, Mont St Michel, and its UNESCO World Heritage-listed, 13th-century abbey. It’s a must-see site for many visitors to northern France and Cancale at the western end of the bay is a great place to try the local seafood as it is famous for oysters. It’s not far from the bay to one of Brittany’s other great treasures, the walled city of St Malo with its cobbled streets and granite buildings. There’s plenty more of the pink-hued granite that’s used in Brittany’s buildings around Ploumanac’h – an area known as the Pink Granite Coast where the geology of the region is laid bare in huge rock formations. It’s also a region with great natural habitats for wildlife. The coast gets wilder and more rugged around its north-easternmost point in Finistère. This is where you’ll find many of the iconic lighthouses for which Brittany is famous as well as Europe’s largest harbour at Brest. Then there’s Cornouaille which underlines the links between Brittany and Britain’s westernmost county with its name, shared Celtic history, fishing towns and craggy coast. Southern Brittany’s Gulf of Morbihan offers a sheltered natural harbour tucked away from the Atlantic’s wind and waves. Historic sites and megaliths can be found around this area as well as sandy beaches that are perfect for swimming, sunbathing and sandcastles. South of this is the department, or county, of Loire Atlantique. Historically a part of Brittany, this region includes the former capital of Brittany Nantes and the mouth of the Loire river as well as more Atlantic-facing sandy beaches and, inland, endless marshes. Some of the most beautiful parts of Brittany’s coast and countryside can be found within the Armorique Regional Natural Park. The park meets the sea between Brest and Cornouaille and stretches inland to the Monts des Arrée, covering more than 450 square miles. If you go camping in or near the Armorique Regional Natural Park, you’ll want to take walking boots, running shoes or bikes so you can get out on the hundreds of miles of marked paths and trails through this protected landscape. A mixture of heather moorland, sand dunes and forests, it's also home to Brittany’s highest peak, Roc’h Ruz which at 385 metres, offers great panoramic views whilst still being accessible to most. Naturally this is one of Brittany’s best areas for wildlife watching. Brittany was once covered in forest and a visit to Paimpont offers a look in to its woodland past. An area of 25 square miles of woodland remains and legend has it that it is the site of King Arthur’s mythical Brocéliande with sites associated with the legends of King Arthur found throughout the area. You can visit turreted châteaux and other landmarks on a visit here during a camping or glamping trip in Brittany. Historic sites including châteaux, fortified towns and villages and ancient standing stones and megaliths are found all over Brittany. 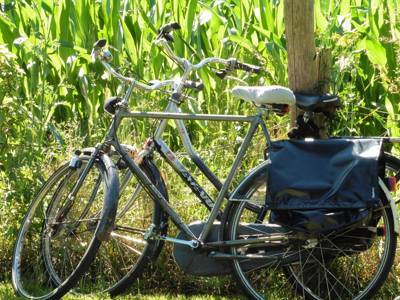 A good way to discover more about the way Bretons used to live is also given in the region’s many eco museums where old villages and industries have been recreated or preserved. For more ideas on places to visit whilst camping or glamping in Brittany, visit the Tourisme Bretagne website. Climb a lighthouse. Brittany’s lighthouses are a classic symbol of the region. With so much rocky coastline it’s no wonder that there are more lighthouses clustered here than anywhere else in the world! Head to the beach. There are some beautiful sandy beaches on both the north and the west coasts – perfect for sunbathing, sandcastle-building, swimming and watersports. Go for a walk. The coast of Brittany, the Regional Natural Park Armorique and the historic streets of St Malo, Quimper and Rennes – all are best explored on foot. Taste regional specialities. Start with oysters from Cancale and finish with a delicious crepe. Brittany’s regional specialities include seafood and French classics! Explore medieval France. North West France is peppered with well-preserved medieval towns and villages so stop off and explore – Mont St Michel, just over the regional border in Normandy, is perhaps the most picturesque. Try the local tipple. Both Brittany and neighbouring Normandy are famed for their apples and, like their English equivalents over the Channel, that means cider is the regional drink of choice. Mess about in boats. With so much sea surrounding Brittany, it’s no surprise that sailing is big business here. Even if you aren’t a seasoned sailor, you can don a Breton stripe and take to the seas on a boat trip with someone else at the helm. Spot a château. There’s a reason why France’s châteaux are so often described as ‘fairytale’ and when you spot a turreted roof poking through trees you’ll see why. Brittany at Campsites in Brittany, Taking the ferry to France? Whether it's camping in Finistère or pitching your tent in Côtes-d’Armor, browse the best campsites in the region with this expertly chosen collection from the authors of best-selling guidebook Cool Camping France.